Fact Check: Is Obama Handing Guantanamo Bay Back To Cuba? President Obama wants to close the U.S. detention facility at Guantanamo Bay. If the prison closes, some have warned, the president would hand the base itself over to Cuba. The old courtroom building at Camp Justice, site of the U.S. war crimes tribunal compound at Guantanamo Bay Naval Station, Cuba. I fear that by the end of this year, President Obama plans to give the Guantanamo Navy base back to Cuba. "One of the things ... I'm very concerned about is that Obama is emptying Guantanamo. He is releasing terrorists that our soldiers bled and died to capture. ... And I fear that by the end of this year, President Obama plans to give the Guantanamo Navy base back to Cuba, which would be undermining U.S. national security interests profoundly," Cruz said. "I hope he doesn't do that. But it is consistent with his pattern of the last seven years. I think it is a profound risk." Cruz has repeated that "concern" in subsequent campaign appearances. Another Republican presidential hopeful, Florida Sen. Marco Rubio, has also "warned" audiences in rallies that Obama could give the base back to Cuba. "This makes no sense to me," Rubio said in Las Vegas, according to the Washington Examiner. "We're not giving back an important naval base to an anti-American communist dictatorship." No, say senior Obama administration officials — the president's proposal covers only the detention center housed on Naval Station Guantanamo Bay. The administration does not want to return the base itself to Cuba. The U.S. has leased Guantanamo Bay from Cuba since 1903, following the American victory in the Spanish-American War. The land belongs to Cuba, but the original agreement — known as the Platt Amendment — gives the United States "complete jurisdiction and control" over the base. A subsequent agreement in 1934 gave the U.S. the use of Guantanamo "in perpetuity," unless the U.S. either unilaterally abandons the base or both the U.S. and Cuba agree to end the lease. Cuban leaders soured on that deal following the Communist revolution and have steadily refused to cash the annual lease payments from the U.S. Treasury of about $4,000. Deputy National Security Adviser Ben Rhodes told reporters that when Obama visits Cuba in March, he fully expects for President Raul Castro and other top leaders to raise questions about Guantanamo's future. "I'm sure that will be part of the discussion," Rhodes said. "They are insistent our presence there is not legitimate, that the facility be returned to them. But that is not on the table as part of our discussions." Rhodes' briefing took place before the Pentagon released its proposal for closing the Guantanamo prison. But another official reaffirmed that position after the plan appeared. Pentagon Press Secretary Peter Cook was asked specifically about the fate of the naval base, and he said it was its own separate issue. "This plan covers the detention facilities at Guantanamo Bay," Cook said. 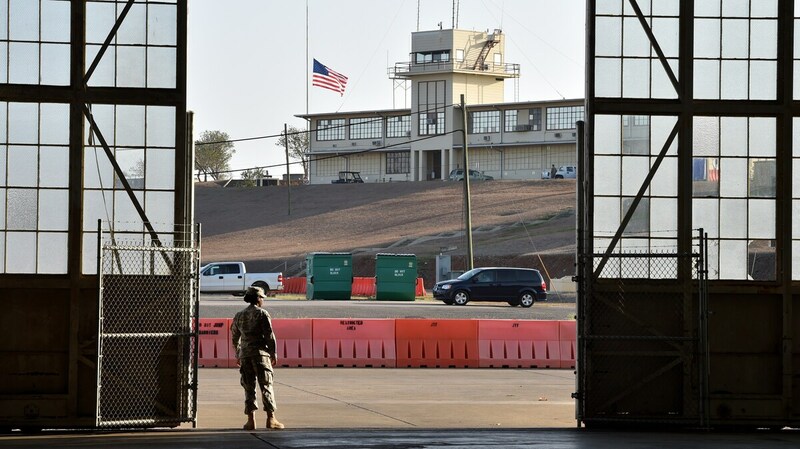 "There is no plan to change the status of the naval base at Guantanamo." The base's location in the Caribbean will keep it relevant for a very long time, Navy officials say. In fact, its importance could only grow once work is completed on the widening of the Panama Canal. Broader, longer and deeper-draft cargo ships will be able to sail through the canal carrying cargo to the U.S. and South America, and the Navy wants to preserve a base from which it could protect those trade routes. Then-Chief of Naval Operations Adm. Jonathan Greenert described the importance of the base when he visited in 2014. "Naval Station Guantanamo Bay is going to be around for a long time," Greenert said. "Often, people think that if the [detention center] leaves then the naval station will be shut down, but that is not the case." "We can repair and restock ships here and enable them to carry out the mission of the Southern Command," he continued. "Also, at this very location, they have an airfield, we have a natural deep port, we have piers and we have room to grow. This base is really an essential part of our future, not only in the SOUTHCOM arena but broadly worldwide. This base is strategically very important to the Navy."